Universal Boschi is a leading manufacturer and exporter of air separation plants such as oxygen plants, nitrogen plants and acetylene plants. With the association of ING. L. & A. Boschi of Italy, our company fabricated plants that perform in compliance with the plants of international standard. We started manufacturing of nitrogen & oxygen production plant at our factory in New Delhi (India) in 1985 and air separation columns in Genova, Italy. The designs of our plants are based on the process cycle of Linde & Claude which had been started by Dr. Boschi of Italy with its company ING. L. & A. Boschi of Italy in 1930. We acquire Boschi technology and design as Boschi technology is proven worldwide for a number of features such as contact design, low power consumption, low maintenance and highly pure output. With the years of experience and technical collaboration with Dr. Boschi, our company has fabricated over 300 air separation plants and equipments. Apart from ISO 9001:2000 certification, Universal Boschi products are also CE approved. Basically, the CE mark is a quality-mark. First, it refers to the safety & quality of a product. Second, most quality markings are voluntary opposite to the CE marking, which is mandatory for the products supplies to European Market. CE indicates conformity with mandatory European safety requirements. European conformity is certified by following clear and understandable procedures, the so-called ‘conformity assessment procedures’. We have got success in manufacturing and exporting low pressure plants as it is the technology of today. 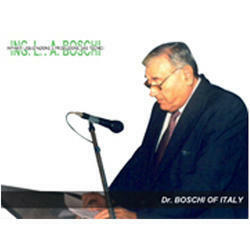 Universal Company Uses The Brand Universal Boschi Italy As Dr. Boschi Of Ing. 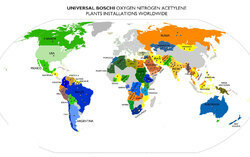 L&A Boschi Gave The Certification To Use The Brand Name Boschi Italy In All The Oxygen Nitrogen And Argon Plants Manufactured By Universal As Per Boschi Italy Technology Acquired Since 1985. ING L.& A. BOSCHI has one of the largest manufacturing facilities and offers an entire range of products under one roof. We also offer a versatile support program with a wide range of after sales services. With our years of experience, We can assist you to operate your plant more effectively. Through our excellent supply chain our customers can procure any spare part or components. We aim to continually improve the quality of our products and services while maintaining a high level of safety and environmental protection. We are one of the professionally managed companies managed by a knowledgeable team, striving to achieve 100% product excellence. We are backed by trained and experienced professionals who work in close coordination with each other and have 26 years of experience in the field of manufacturing, installation and commissioning of air separation plants. Our quality controller conducts quality test to ensure the end product is of superior quality free from any defects right from initial stage of raw material to the finished product. Empowered with in depth knowledge and latest developments, they are effectively catering to the varied demands of a number of industries. We even conduct consistent development training sessions to make our workforce updated and operational with newest technological advancements and developments. We have manufactured over 500 AIR SEPARATION PLANTS & EQUIPMENTS since 1985 in technical collaboration with ING. L & A Boschi ITALY over 30 years. Recently we have exported over 500 complete air separation oxygen/nitrogen/acetylene plants & equipments to over 40 countries including USA,UK, Australia, New Zealand, Suriname, Honduras, Chile, Bolivia, Saudi Arabia, Indonesia, UAE, Dubai, Jordan, Maldives, Spain, Guam, Brazil, Seychelles, Kazakhstan, Malaysia, Taiwan, Nigeria, Ghana, Congo, South Africa, Benin, Columbia, Europe, Germany, Turkey and many others.